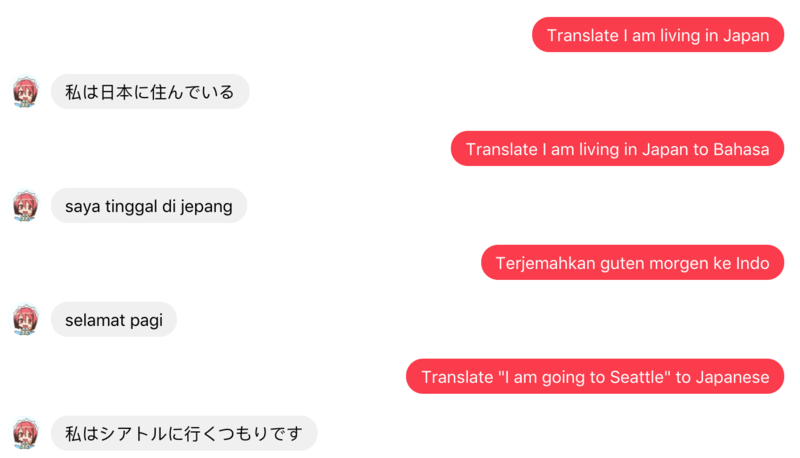 Maid-chan feat translate-shell provide an interface to use Google Translate as translation tool via Facebook Messenger. Since there are multiple mapping possibilities (“id”, “Indo”, “Indonesia” have the same meaning), “from” and “to” keywords are mapped to its appropriate language code. Currently, Maid-chan supports Bahasa Indonesia, English, and Japanese. If Maid-chan could not recognize proper mapping, get_trans_language_prediction is called. This function will use Google language detection to see whether Maid-chan could map source text into 1 out of 3 supported languages.